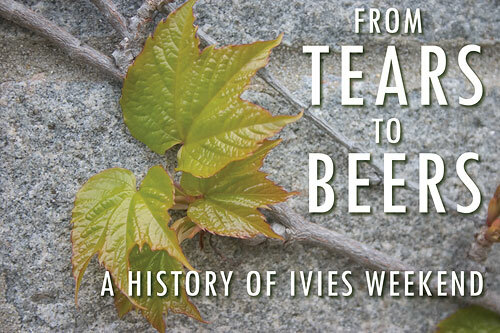 Today marks the beginning of the 141st Ivies Weekend. A holiday of drunken debauchery?a campus-wide party of monumental proportions spanning two days?awaits all Bowdoin students who choose to partake. With exams only two weeks away, many see this weekend as the last chance to party hard before the final academic push. A student standing at the Pinestock concert with a Budweiser in hand, reveling in the glory of it all, might not feel a great connection to the College's history. He ought to, though. Ivies has a long, interesting history that connects students of today to those of the last century?a history that, as it turns out, has absolutely nothing to do with the Ivy League. The tradition of Ivy Day at Bowdoin began on October 26, 1865, when the junior class, following in the footsteps of Yale University ritual, planted an ivy near the Chapel. On that Thursday, 141 years ago, a poem, an ode, and an oration were presented to the junior class. "There was a lapse of eight years," according to an April 1976 Orient article, "before Ivy Day was revived." In June 1874, the class of 1875 planted an Ivy and added a rituals to the day. (Ivy Day, and, later, Ivies Weekend, has been held in the spring ever since.) Prizes known as "Junior Honors" were awarded to members of the junior class. According to "The History of Bowdoin College," a book written by Louis C. Hatch in 1927, "one honor [was] real and always the same. A wooden spoon [was] given to the most popular man in the class," the person more highly esteemed and respected than any other junior. The other prizes handed out on Ivy Day were humorous. Among them were a "mirror for the most handsome man" and "a jackknife for the ugliest," according to the Orient article from 1976. Other prizes were also awarded according to a 1932 issue of the Orient: A spade was given to the biggest "grind" and a moustache cup—a drinking class crafted to keep a man's moustache from soaking in his drink—was bestowed upon "the man with the lightest beard," an apparent attempt at ironic humor. Ivy Day was not just for the junior class, though. Starting soon after the Day was revived by the class of 1875, the senior class became an integral part of the Ivy ceremonies. On Ivy Day, all the seniors stood around the Thorndike Oak and smoked a peace pipe, each man passing to the next. Seniors then walked, in formation, to their last chapel service. "There is a brief service, then the Seniors in solid body, lock-step, move slowly down the aisle singing 'Auld Lang Syne,'" Hatch wrote. "It is a touching scene, not only do some of the fair spectators shed tears but the Seniors themselves are at times unable to control their emotions." One man in the Class of 1892, "a big, hardy fellow, the very reverse of a sentimentalist" was stricken with such emotion during the march down the aisle that he had to be held up by his classmates, according to Hatch. A few tears may be shed this Ivies Weekend, but it is unlikely that a rendition of Auld Lang Syne will be the precipitant. "Beer tears" are not, after all, often caused by sentimentality. And they are certainly not caused by sadness over Bowdoin not getting into the Ivy League, a common myth, because Ivies Weekend has nothing to do with the Ivy League. "A few years ago admissions tour guides were telling people that it represented a time celebrating Bowdoin's turning down of an invitation to join the Ivy League," Secretary of Development and College Relations John Cross said. "That's absolutely ludicrous!" There's no evidence that Bowdoin ever was offered or rejected a place in the Ivy League. As it turns out, the Ivy League was organized in 1956. Bowdoin's Ivy tradition began more than 90 years earlier. The term "Ivy League" was coined in the 1930s. The Ivy League "didn't issue invitations in the first place and, in the second place, they wouldn't have been inviting Bowdoin, I don't think," Cross added. Other similar rumors?that Ivies weekend is a period of celebrating the College's independence on the anniversary of Bowdoin's rejection from the Ivy League, for example?are also wholly untrue without factually basis. Partying and music are inextricably bound in the tradition of Ivy Day and are, perhaps, the strongest link between the Ivy Day of 1865 and Ivies Weekend of 2006. After the first Ivy was planted, Bowdoin students threw a "party" (in the most general sense) in the Brunswick Town Hall that included a concert and a dance. Despite their best efforts to entice residents of Brunswick and Topsham to the event, organizers were sorely disappointed with turnout. The November issue of the Bugle?then published monthly?scolded locals for missing such an entertaining time. There were whispers of "a few lady friends from out of town" staying at Bowdoin for the Ivy Day festivities in 1877, which was a harbinger of the parties to come after the turn of the century. Bowdoin graduated its first female student in 1971. As an all-male school with strict rules regarding female guests, Ivies provided a rare opportunity for male-female interaction. According to Secretary of the College Richard Mersereau '69, until the school went co-ed, stringent "puritanical" regulations regarding students' dates were enforced without mercy. "There were all sorts of arcane rules: Women could be in a room above the first floor, where all the bedrooms were, until five o'clock. And then, because they wouldn't have places to stay, the people living in the fraternity would leave and the women would stay there," Mersereau said. "Occasionally someone would break the rule and if they were caught, they were thrown out of school." The first party at a fraternity house was hosted in 1911 at Kappa Psi Upsilon (now Quinby House), marking a shift as Ivy Day became part of a larger Ivies Weekend. The first college-wide event was a "gym ball" held in 1912. The next week's Orient noted that some students and their dates danced until sunrise. This is not surprising given the fact the College's harsh regulations. The gym ball became the "Ivy Ball," which students looked forward to all year along with the multitude of other special events that followed Ivy Day. "Juniors observe Ivy Day," a May 23, 1924, Orient headline trumpeted. "Fraternities hold house parties," a sub-headline added. "Receptions, house dances, picnics, dinner dances and gym dance make Ivy of 1924 most enjoyable in many years." Each Ivy Ball had live music often performed by the most popular bands of the time. Duke Ellington came in 1928 and 1932. Louis Armstrong performed in 1936. Count Basie came in the early 1960s. Simon and Garfunkel performed in 1967. Even after the Ivy Ball ceased to exist, top bands graced Bowdoin's campus. B.B. King performed in the mid-1970s, for example. Despite the pall of the Great Depression, the 1930s was a hallmark decade for Ivy Day and the following weekend. Parties roared at all 12 fraternities until early in the morning and alcohol flowed readily?even during Prohibition. During World War II, it appears that Ivy Day traditons continued, if with little celebration. This is not surprising: Most of the civilian population of Bowdoin had gone to war. In the 1950s, Ivies continued as it had in the 1930s. "It was a terrific weekend. It was really fun," John R. MacKay, II '56 said. "Everybody consumed more alcohol then they should have, but we all survived." MacKay is a partner at the law firm of Lowenstein Sandler PC. The 1960s, a time of tumult and change in the United States, was also a time of transformation for Ivy Day. In 1964, the formal ceremonies (the presentation of the poem, the ode and the oration) ceased to be performed, although an Ivy was still planted by the junior class each year for the '60s. The class of 1970 was the last group of juniors to plant a class ivy. Prizes, the wooden spoon in particular, continued to be handed out every Ivy Day until 1970. It is unclear when the ugliest-man prize ceased to be awarded. Despite the end of the traditional planting of the ivy in 1970, the let-loose, party-hard, alcoholic spirit of Ivies Weekend only grew. In 1971, the first Ivies Weekend without any rituals (other then heavy drinking) took place. In an Orient article from that year, Ivies is written up as being filled with "rock concerts, beach parties and some of the year's wildest campus debauches." Alumni recount that drinking remained central to the weekend. "It was just parties back then," Mark Worthing, M.D. '77 said. And frat parties, as had been the case in decades before, were where the action was. A number of frats had parties off-campus. People would "play on the beach and bring kegs of beer." Beer aside, the Ivies of 1975 had little connection to history. "By the time we were there, the tradition of the Ivy had been lost," Worthing said. In 1976, the ceremony of Ivy Day was revived, if for only a year or two. A wooden spoon was awarded to a member of the junior class, an oration and a poem were given, and, in place of an ivy, a tree was planted. "I really like how it all turned out," Worthing said. "It was raining but we were under the opening of the VAC, which was brand new right then. We had this tree to plant... It was just nice to see that [tradition] again." It was the Ivy Day tradition's last hurrah. In the 1980s, Ivies Weekend was a big, important party, although bereft of any 19th-century tradition. "It was a big deal," Marijane Benner Browne '83, a lawyer, said. "People definitely drank." As the fraternity system was phased out in the 1990s, Ivies Weekend changed only in the venues where students went to drink: from frats to College Social Houses. The new millennium brought a small dose of anarchy to Ivies at Bowdoin. After a series of incidents, dinner on the Friday and Saturday of Ivies was moved outdoors and plastic trays and metal knives and forks were replaced with paper plates and plastic silverware. Two years ago drunken students chopped down a tree causing thousands of dollars worth of damage. In 2005, the Bowdoin Fire Department had to be called to remove an student from a tree after he became stuck. This year marks the 141st celebration of Ivies. We've come a long way since tearful renditions of 'Auld Lang Syne.' For better or for worse.